The R.I.P. column just got one name longer. The Rocky Mountain News, a Denver institution for 150 years, will publish its last issue tomorrow. A three-month long effort to sell the property yielded only one nibble, and the prospective buyer backed away quickly after learning that it would cost about $100 million “just to stay in the game,” said Rich Boehne, chief executive officer of E.W. 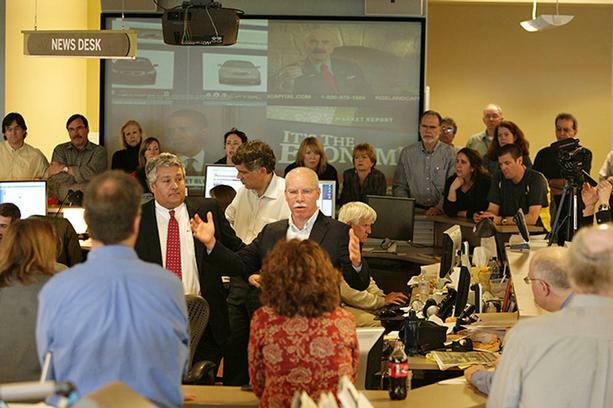 Scripps Co. “The industry is in serious, serious trouble,” he told staffers assembled in the Rocky‘s newsroom (above, Rocky Mountain News photo). The news came as no particular surprise, given that the deadline set by Scripps in December was drawing near and no buyers had announced their intentions. In a Web 2.0 twist, staffers live blogged the meeting. Staffers will be paid through April 28. The newspaper had 220 newsroom employees as of early December. No word yet on how many will lose their jobs. Meanwhile, tomorrow’s issue will no doubt be a collectors item. This entry was posted on Thursday, February 26th, 2009 at 3:45 pm	and is filed under Facebook. You can follow any responses to this entry through the RSS 2.0 feed. Both comments and pings are currently closed. Well here we are. The largest metro to fail thus far. Posted by Rocky Mountain News: “It’s strange to cover your own funeral” | 神丹….i will kill you…kill myself first..
Not 150 years, but 149.6 years. Just a few months short of its 150th. The better paper (I received both every day) dies. My prediction: Dinky Singleton will declare bankruptcy within a few months. i’m curious what this ‘no buyers’ stuff is about. what determines the bottom price, and isn’t something better than nothing? 2. The Germans helped for almost 2 years with the daily production. 3. Both owners had different agendas and could not bridge the Republican-Democrats gap. Too many fights for power. Just like here in NC “just another one “detailpaper” bytes the Internet dust”. People want several colors of the society rainbow. We have up to 14 printed free weekly and monthly publications. They stay alive and prosper. Why not the old fashion NEWSPAPERS ???? Classic fight editorial the add people, the sports people the living department………..